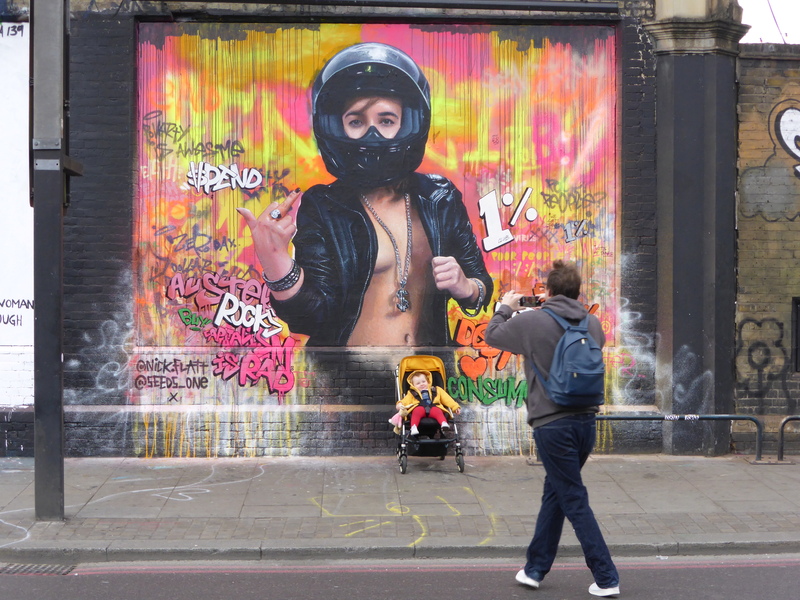 Over the last seven days Shoreditch was witness to Week Four of the ‘Behind The Curtain’ Street Art competition, ending a month of fantastic pieces. 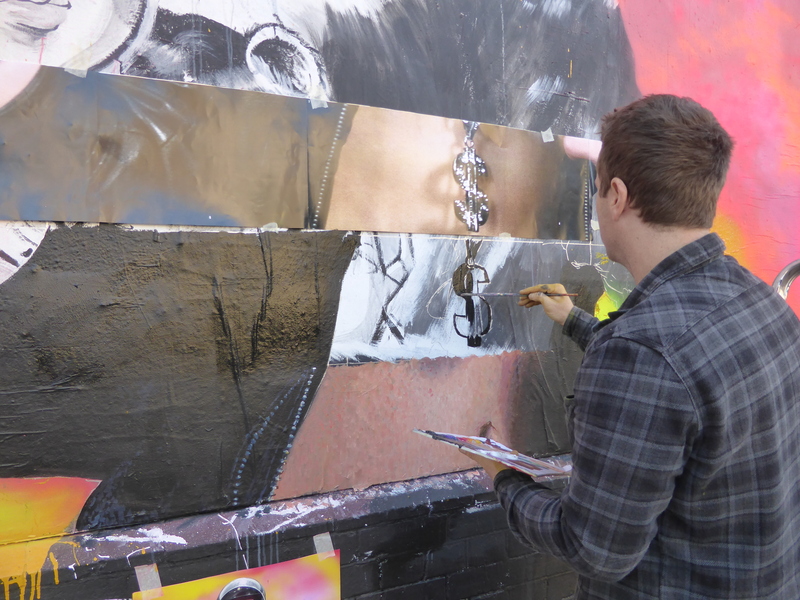 With the competition having now concluded, we have seen works from sixteen artists, who have over the period of four weeks competed to win the £1000 cash prize and opportunity to paint the entire wall themselves. 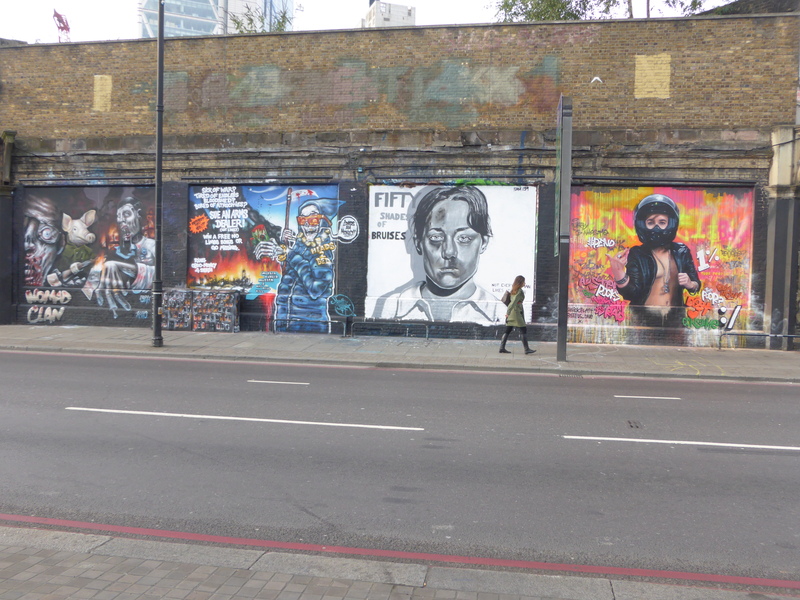 Each contending artist has had one week to showcase their art on one of Shoreditch’s most prominent locations. The winner will be chosen by a panel of three judges, and announced this week on October 22nd, we will be sharing the announcement of the winner and showcasing all four weeks worth of pieces later in the week, as well as looking forward to seeing what the winner creates on their own across all four panels. 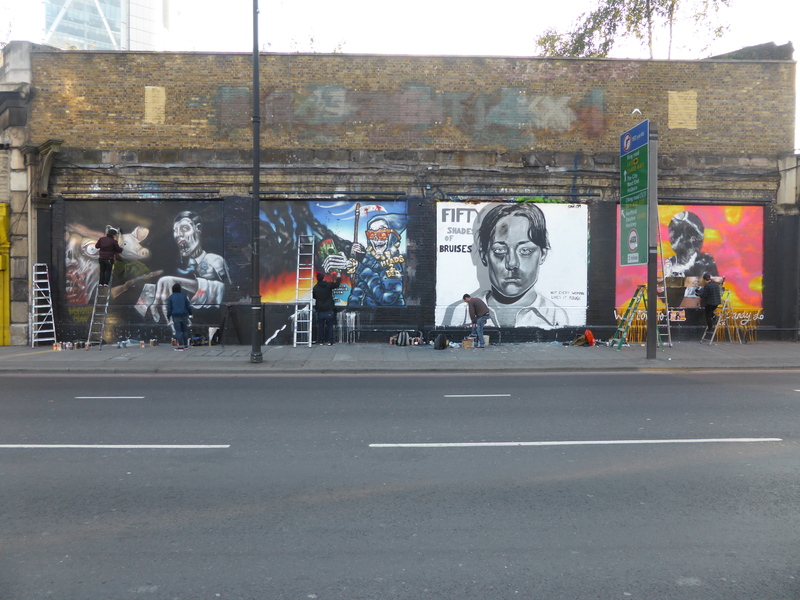 Well we have had a consistently high standard over the preceding weeks of the competition, however it is fair to say that as an entire wall, Week Four really made for the best collection of works, and has also brought for us, the two best works from the entire competition. 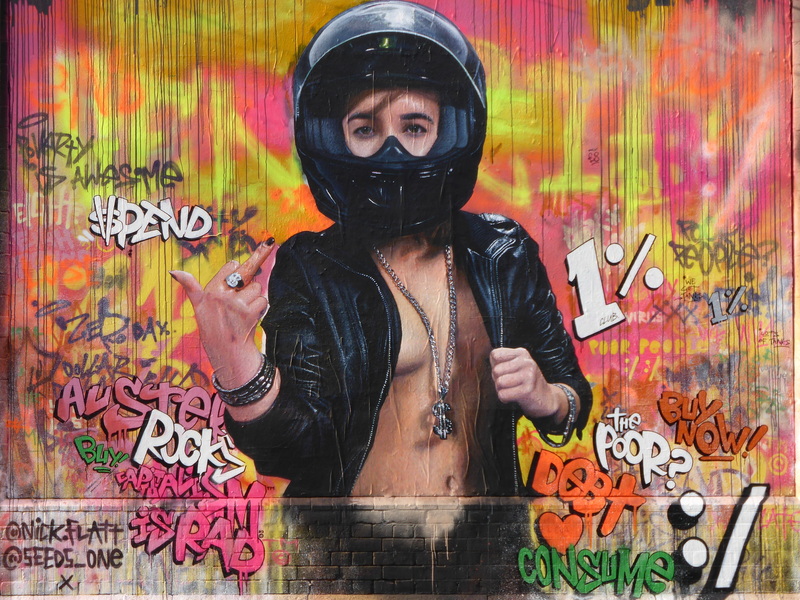 What is of note also is how in the previous three weeks, no one had opted to make a social, political or overtly satirical comment in their work, yet in the last week, each artist painted something that was very much a statement in its own way. 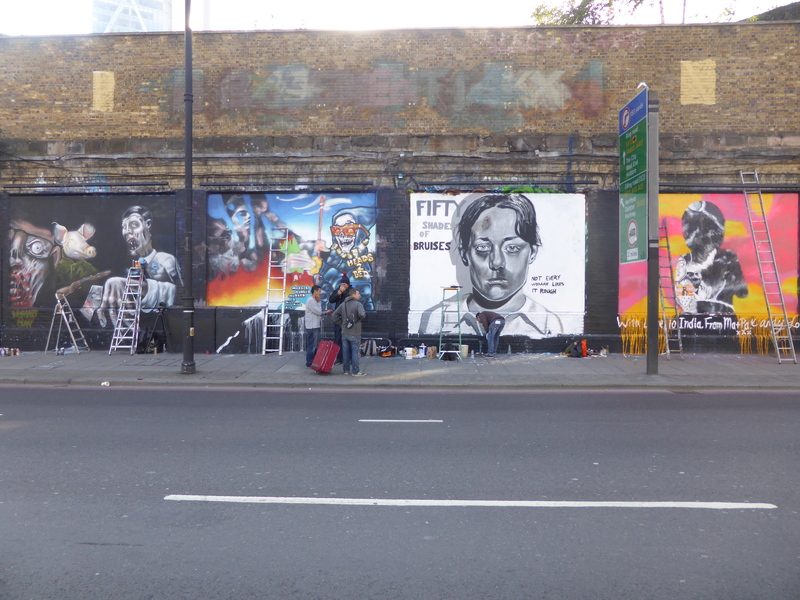 For the first time in the competition we had all artists painting their respective panels on the first day of the final week, quite the sight. 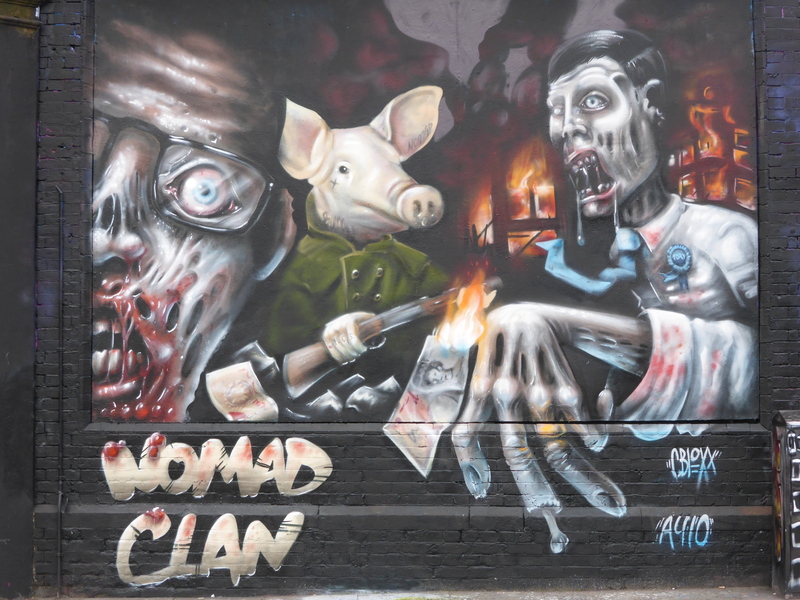 Nomad Clan duo CBloxx & Aylo at work last Monday. CBloxx at work last Monday. Furia at work last Monday. Nick Flatt starting his monumental six days work on Monday. Seeds One & Nick Flatt at work on Wednesday, with Seeds at work on the background and accompanying text as Nick was more than busy with his centrepiece. Seeds One and Nick Flatt finishing off an incredible six days work on Saturday evening. 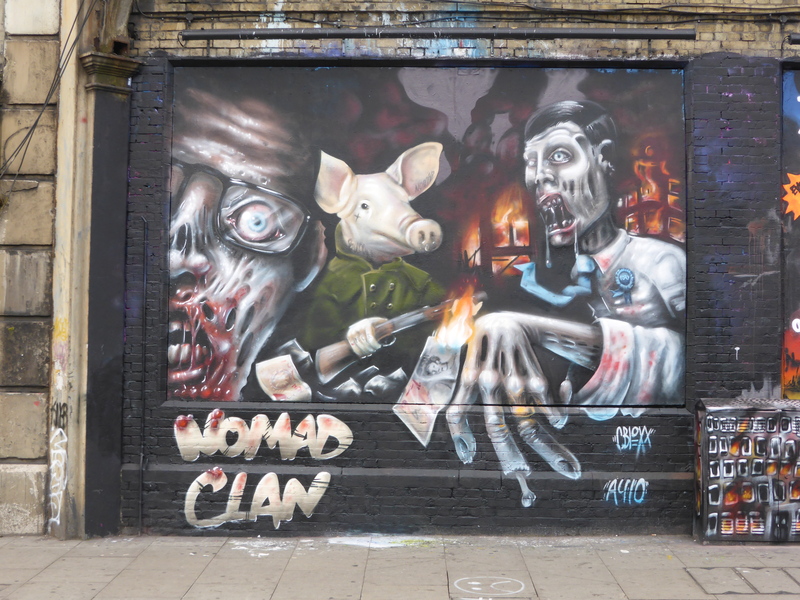 Fantastic work from Nomad Clan duo, Aylo & CBloxx, which is something special indeed. This pair are two of our absolute favourite artists, always creating interesting works fueled with a sense of surrealism combined with hyper-real representations. 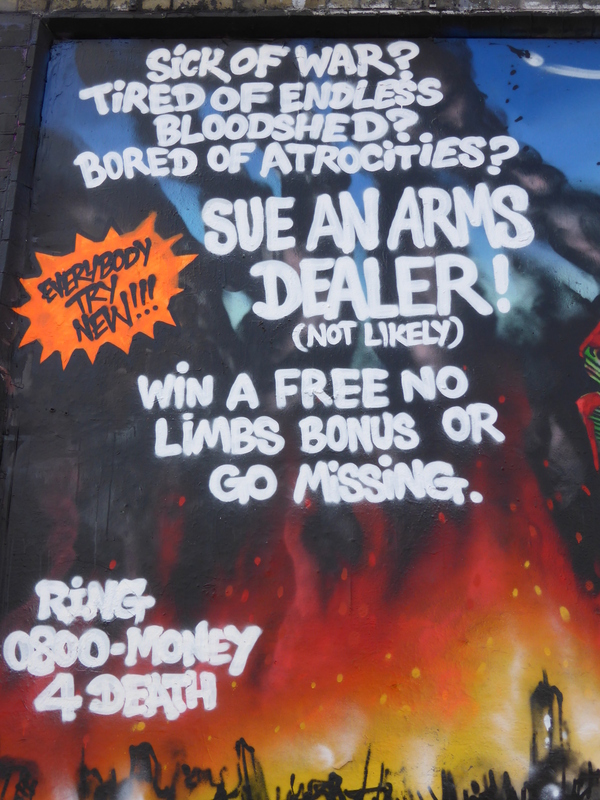 This work takes on a tone rather appropriate for upcoming Halloween with their ‘Tory Zombie Apocalypse’ scene, which is certainly a humorous take on the recent political scandal involving the Prime Minister David Cameron, set amid a frightening cast of characters. 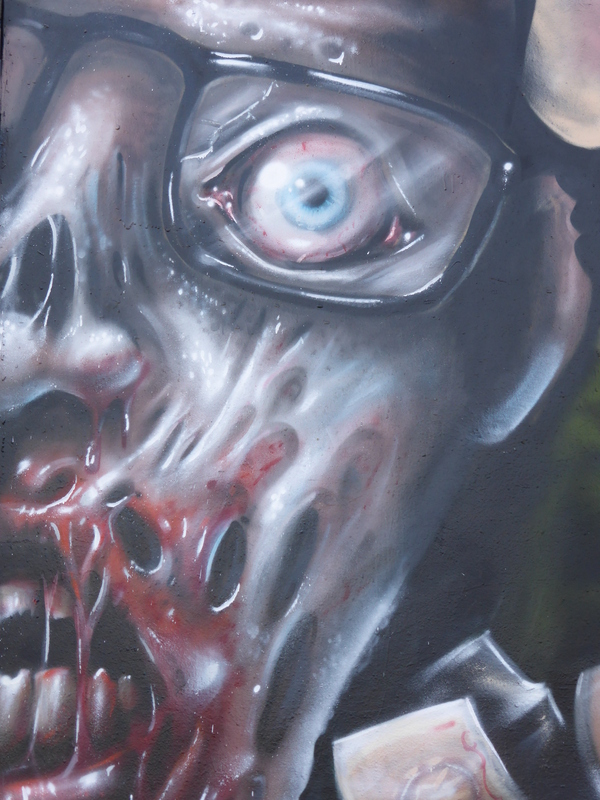 The detail in the zombie’s face on the left is just macabre and absorbing, we really love the reflection effect on the glasses. 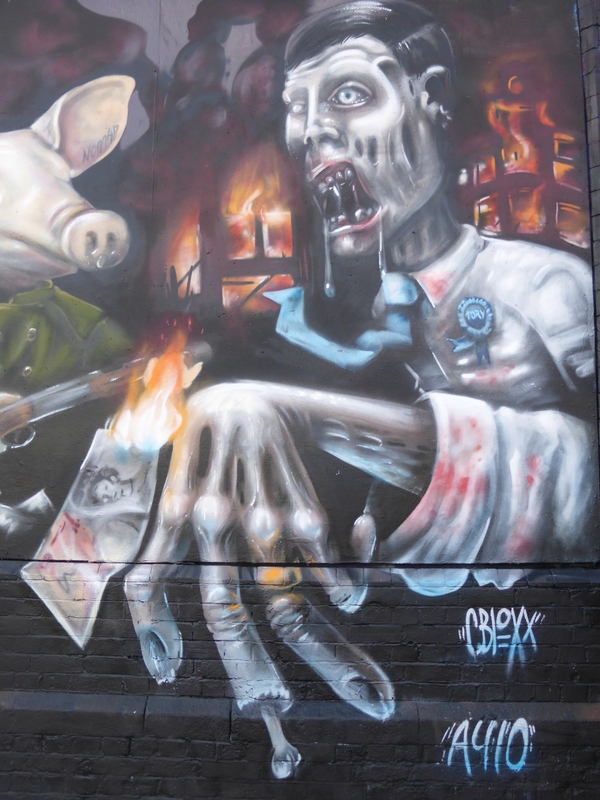 The gentrified pig armed with shotgun just brings a smirk to the face when viewed, aiming its shotgun at the zombie to the right who is wearing a blue tie and Tory Party ribbon. For us this is our second favourite work of the entire competition. 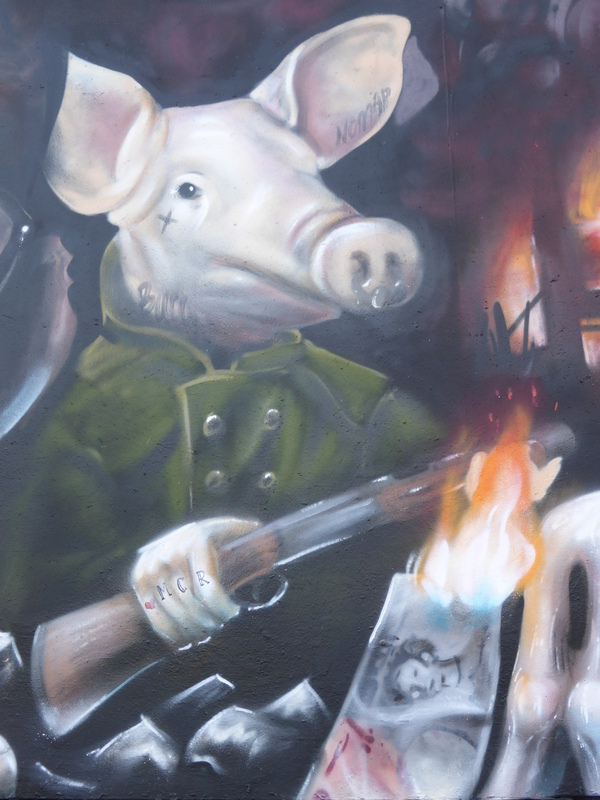 Detail of work by Aylo & CBloxx. 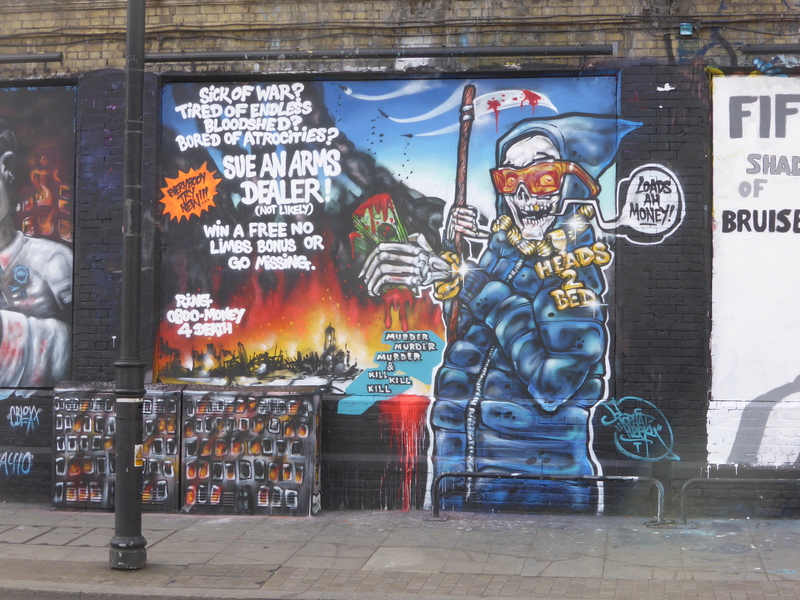 Work from Tizer, one of London’s most prolific Graffiti Writers, with a rather sarcastic advert for legal action against all the destruction in the world, in particular arms dealers and wagers of war, depicting a rather chilled Grim Reaper in ski-wear and lavish jewelry standing presiding over a scene of hell, all set out in the distinctive character and scenic style that is very much Tizer. 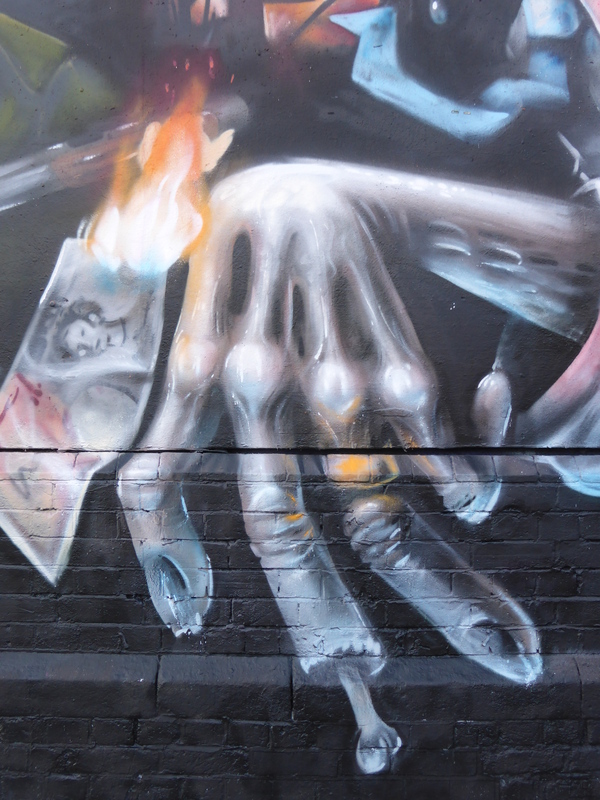 Detail of work by Tizer. 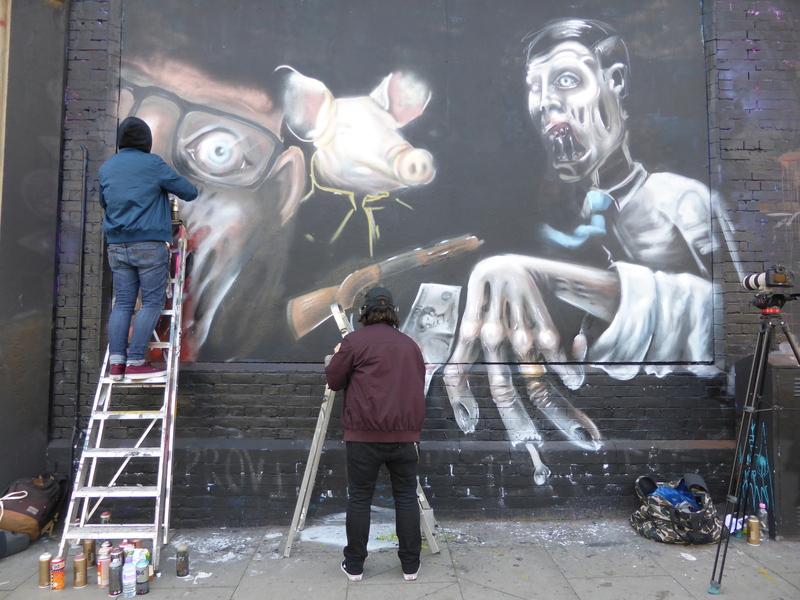 Powerful work by Furia139, of whom it has been some six months since we have had the privilege of catching at work painting live. 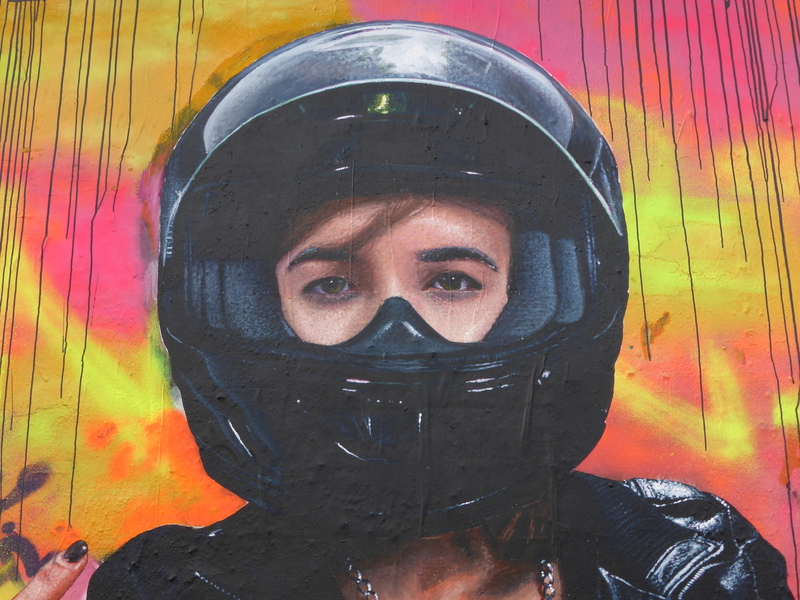 We very much admire Furia’s grey-scale portraits and really think it’s fair to say this is one of the best works of his we have yet to see here at London Calling Blog. 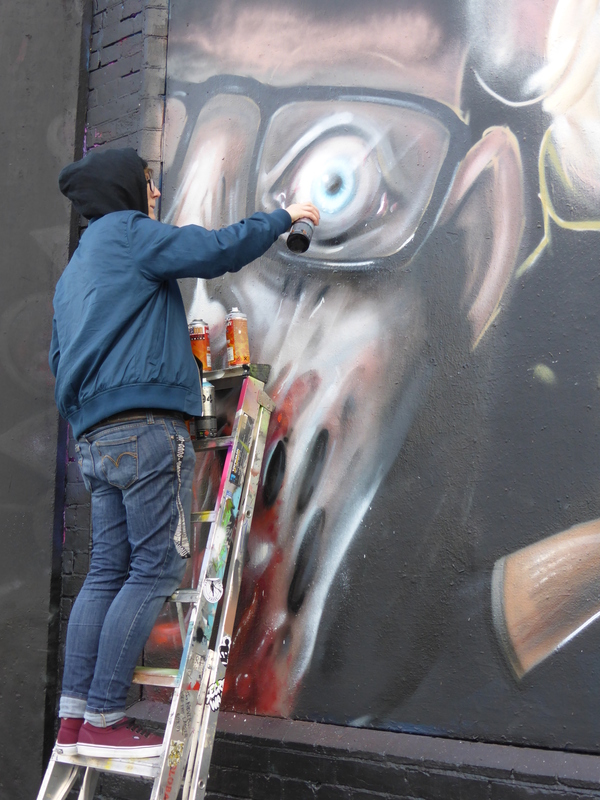 Furia’s distinctive gritty style created through painting by brush really suited the brutal subject matter. 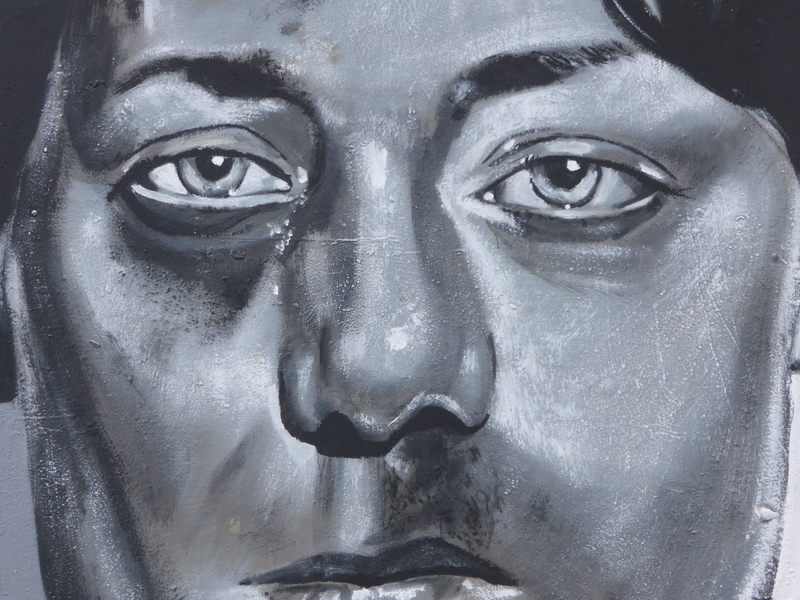 Depicting a beaten woman, Furia has really captured that battered expression and dejected look in the woman’s eyes. 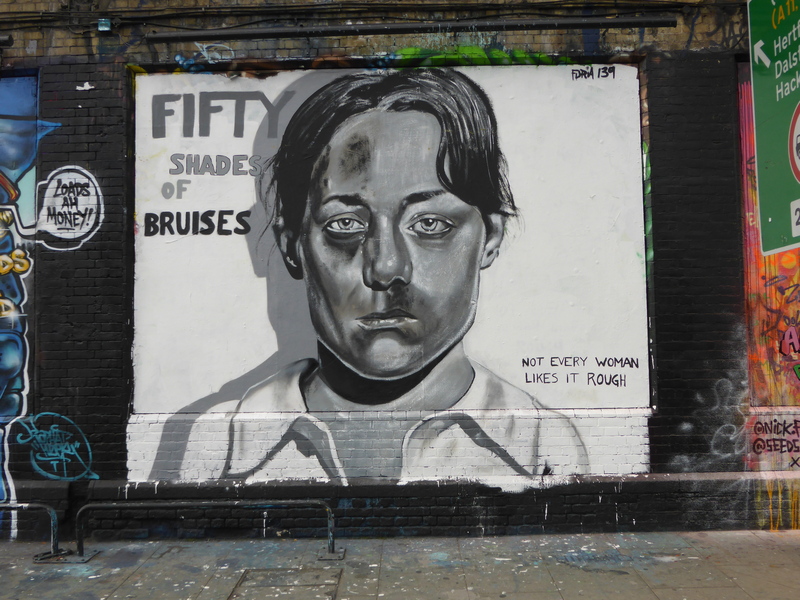 The work entitled ‘Fifty Shades Of Bruises‘ speaks for itself and says much in the process. 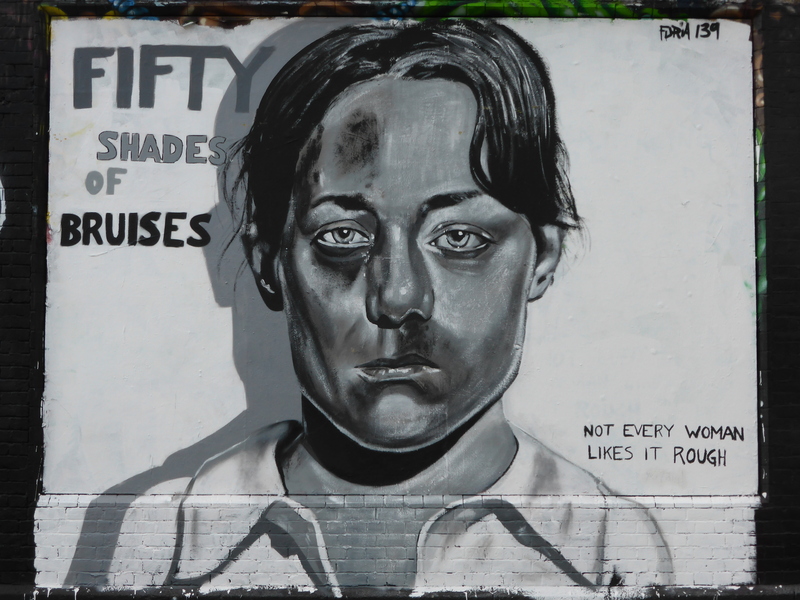 Stunning work with a powerful message from Furia, impressive to see. 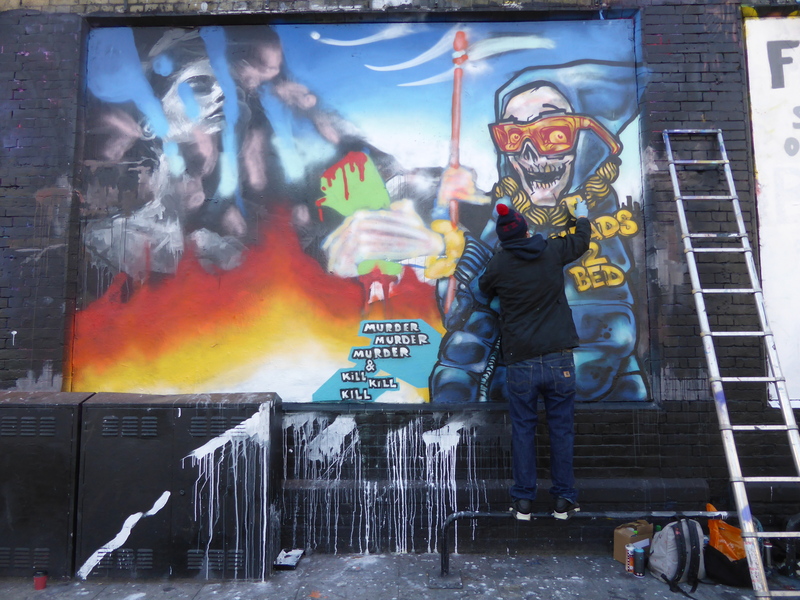 Just spectacular show-stopping work from Nick Flatt & Seeds One, and it has to be said the most impressive work of the competition for us here at London Calling Blog. 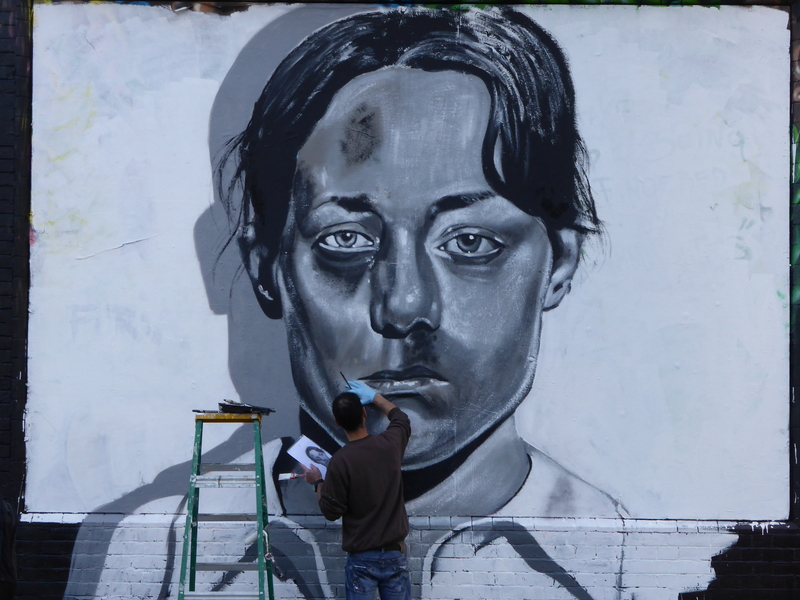 This work is the definition of photo-realism and certainly amazing to see executed on such a scale. For this work Nick Flatt painted the central figure entirely by brush, meticulously and quite literally building up his portrait over six days of relentless work. 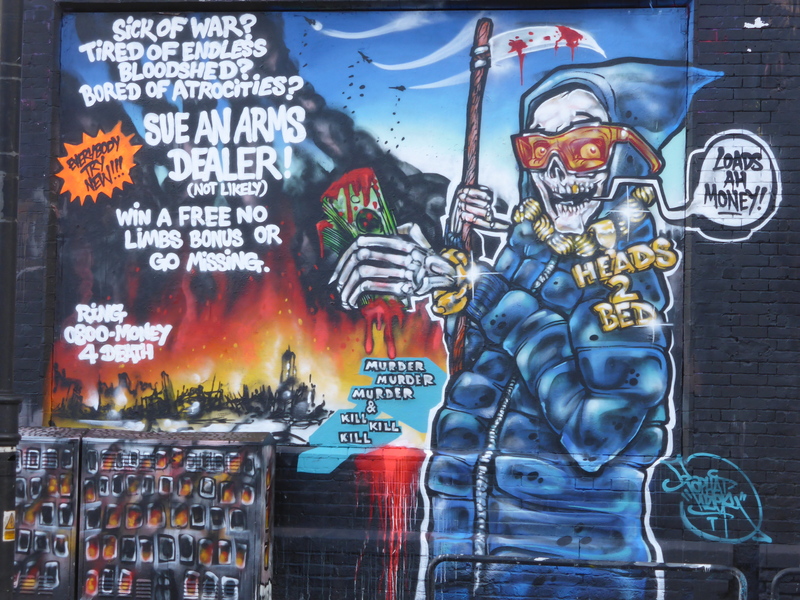 Accompanying the central figure are the colourful background tones and additional typography added to the piece in order to enhance the underlying message of the work, provided by Seeds One. 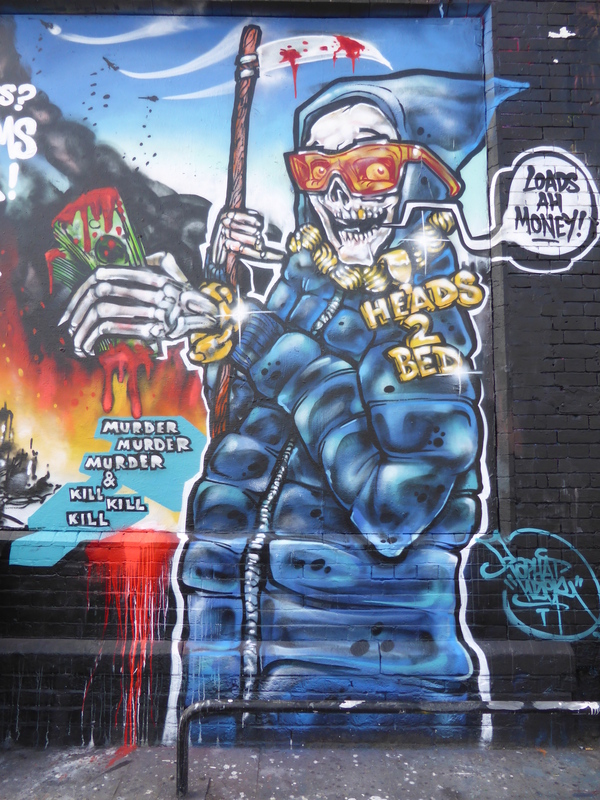 This piece entitled ‘Capitalism Is Rad™’ makes a statement against gentrification and the financial gap in society, and is encapsulated by Nick’s central character who represents that glamorous all-powerful 1% who control the world’s wealth and just really doesn’t care, nothing will stand in her way, epitomized by the action of offering the finger to all in her path. 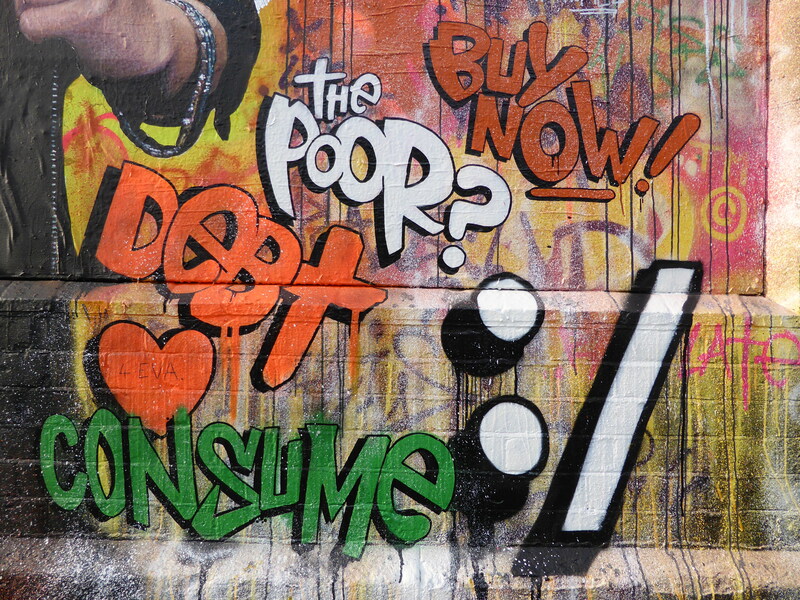 Whilst Seeds’ accompanying text portrays the underlying narcissistic thoughts and attitude of this elitist force, feeling that people should buy more, get in debt, aspire to be better and frankly just consume and accept their fate, in order to maintain the status quo. 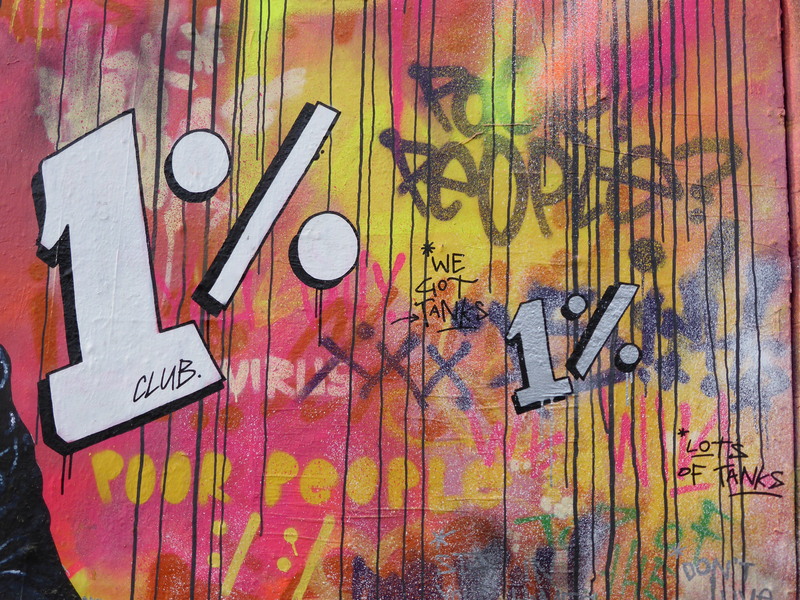 For the wealthy 1% ‘Austerity Rocks©’, a choice of language designed to highlight such practices as the appropriation of terminology and cultural practices for their own use. 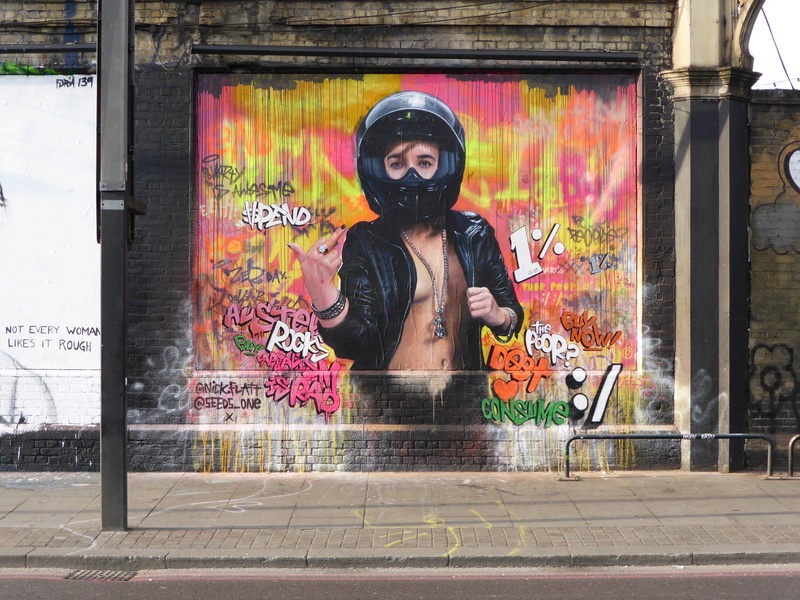 All in all just incredible, really has to be seen to be fully appreciated and certainly the perfect piece to conclude four weeks of 16 wonderful pieces of Street Art. 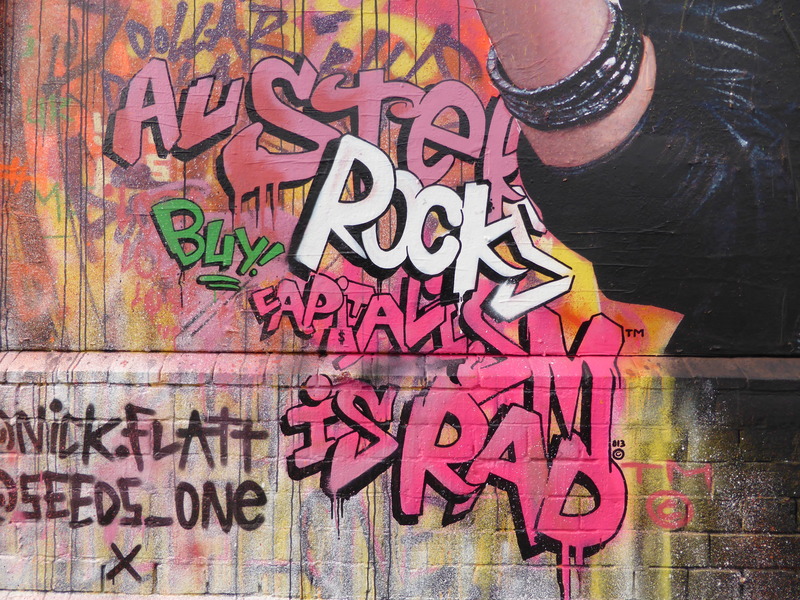 Detail of work by Nick Flatt. Scale shot which also demonstrates everyone just wanted their picture taken with this piece. 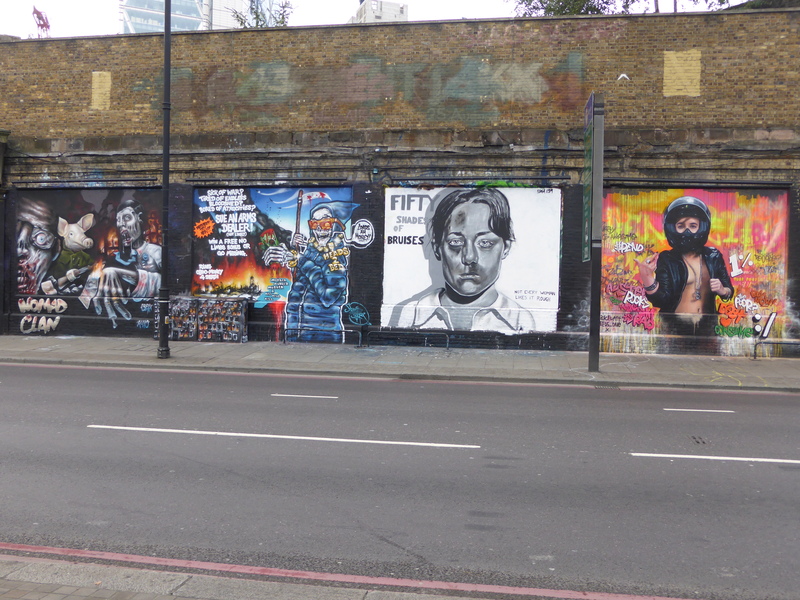 The completed four panels from Week 4 of the ‘Behind The Curtain’ Street Art Competition.